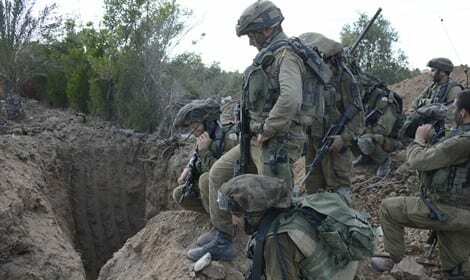 A new system designed to detect terror tunnels is being tested in the field for the first time ever, a senior IDF officer revealed on Monday. Should the field test prove successful, the entire detection system could be deployed around the Gaza Strip in under a year. The system will cost approximately 1.5 – 2.5 billion NIS ($432-720 million). The latest military campaign in Gaza, Operation Protective Edge, highlighted the danger posed by Hamas’s terror tunnels and emphasized the need to a detection system to better protect Israel’s border and its citizens. The new system, along with a partner system, have both proven successful at detecting subterranean movement under lab testing. The IDF official explained that over the years, some 700 ideas have been tested in over thousands of trials to find an answer to the growing tunnel threat. All of them have failed – until now. The two projects that are undergoing more extensive field tests have failed in the past, but after being improved, are now ready for real time use. No stranger to using technology to defend its country, Israel has utilized some of the most innovative technological advancements to protect its citizens, such as the Iron Dome. While other low-tech ideas have been presented to the IDF, the officer noted that a mix of physical and technological capabilities will be most likely used to protect the border. “A physical obstacle like a moat or an internal wall is possible, but costs a lot of money,” the officer noted. He added that Israel will install physical barriers, geology permitting, around suitable and sensitive locations. The technological system itself will comprise a two to three layers that, when connected, will be able to detect tunneling or movement in the tunnel. During Operation Protective Edge, the IDF announced that it would be focusing its efforts in Gaza on dismantling Hamas’s terror tunnel infrastructure. Forces located and destroyed over 30 tunnels dug by Hamas, each reaching into various parts of Israel. Several times, Hamas terrorists succeeded in infiltrating Israel using the tunnels. In some instances, IDF forces were ambushed and killed. In others, soldiers were able to thwart the impending attack. In total, 11 IDF soldiers were killed in attacks using terror tunnels.